After our first season in Salem, Word Plays returns this fall! Over a dozen performers will be telling during this season. At each Word Play, a different group of performers tell rarely heard contemporary and traditional stories about being human. You will discover that Word Plays is a shared experience between the audience and the performer, combining the intensity of a solo performer with the intimacy of a face-to-face conversation. Sept. 13 These tellers share stories about people, in fact, foltale and fiction, who had a choice to make in their life's journey: Siri Allison, Betty Cassidy, Margaret French, Nancy Marie Payne. Oct. 11 Thomas Wolfe wrote, "You can't go home again." Find out if he was right by listening to stories told by: Siri Allison, Fran Berger, Kelvin Keraga, Mary Murphy, Barbara Palumbo, Margaret Waterson. Nov. 8 If we're lucky, we've experienced unexpected kindness. 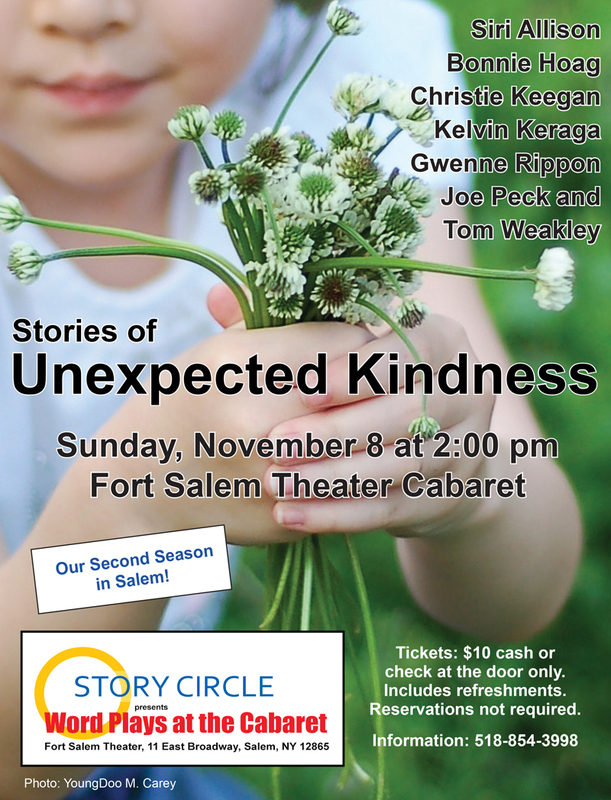 Come hear some fabulous stories about unexpected kindnesses, both large and small, which draw all kinds of people together.